Geared towards family, this is a ride for all. 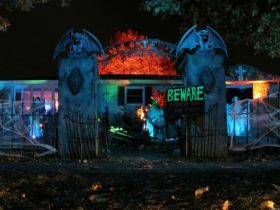 Decorated over a wide stretch of land, the 25-minute experience winds through haunted “old towns” and morbid tunnels of lights, sounds, and fog– all the while on the back of a small, open passenger train. 5202 Zoo Dr., L.A.; 7–10:30 p.m.; $20. This attraction features a guided walk through Altadena cemetery, with theatrical performances to watch along the way. In large groups, this is an adventure to be shared. Some of these year’s productions include The Damned Thing, Thoth’s Labyrinth, and The Open Door and Liliom. 2300 N Marengo Ave, L.A.; 8a.m.-5p.m. ; $40-80. Featuring the infamously frightening clowns, the Hayride is for the more mature audiences. It takes riders through the darkness of Griffith, danger all around. Proceed with caution. 4730 Crystal Springs Dr., L.A.; 7-10:30 p.m.; $35-60. In the heart of Hollywood, the Hotel allows you to choose from nine rooms of different levels of scares, from mystery crime genres to pure horror genres, in which you are locked until you put together the clues to escape. Best in groups and at night, the attraction promises to be a lot of fun. 6633 Hollywood Blvd., L.A.; 11pm-12am; $39-50 depending on group size. A mix of watching and experiencing, this walk-through is not for the light-hearted. Not only must you enter all alone and at your own discretion, but you must guide yourself through the Victorian, seeing only so far through the darkness. One of the biggest thrills in L.A., it’s sure to get some screams. A crazed atmosphere where everyone is in costume and the spirits come out to play, the parade/carnaval features DJs, bright lights in amid darkness, and Live Entertainment. With crowds of up to 500,000 people, this is no neighbor’s backyard party. One-mile stretch of Santa Monica Boulevard/Historic Route 66 between Doheny Drive and La Cienega Boulevard; 6 p.m. to 10:30 p.m.; free.